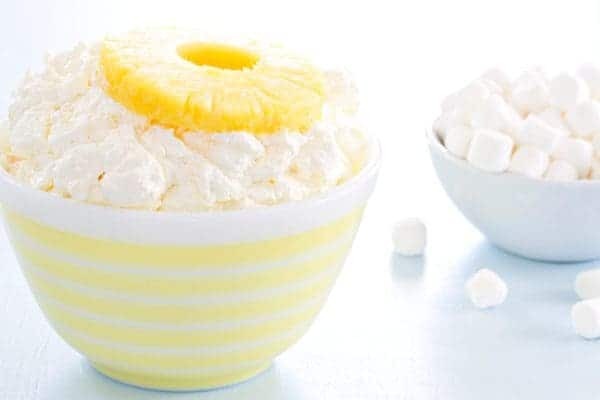 Pineapple Fluff comes together in a matter of minutes to create a dreamy pineapple dessert that is perfect for spring. Your barbecue guests will love it! If you read MBA on a regular basis, you know that we’re kind of obsessed with fluff desserts around here. From Cranberry Fluff and Orange Fluff to Ambrosia, creamy, dreamy desserts are where it’s at – especially during the warmer months. Since making Orange Fluff last month, I’ve been all about experimenting with different flavor combinations and this Pineapple Fluff is most definitely our new favorite. With just a handful of simple ingredients like pineapple Jell-o mix, crushed pineapples, cottage cheese, whipped topping and Campfire® Mini Marshmallows, you’ll be whipping up this delicious pineapple dessert all summer long. When I posted the Orange Fluff recipe on Facebook last month, some people were a little iffy about the cottage cheese used in the recipe. But I’m here to tell you that it imparts an amazing texture to this dessert, and also prevents it from being too sweet. Please don’t skip it or swap it! My mom always pureed the cottage cheese when she made fluff desserts. Pureeing the cottage cheese makes it pretty much undetectable and creates a thick, creamy texture that makes the fluff – well, fluffy. My dad absolutely loathes cottage cheese, and he had two huge servings of this after dinner. In fact, he still doesn’t know he was raving about a dessert that contained cottage cheese. Make sure you use the right marshmallows for this recipe. While I love Campfire® Marshmallows’ mini fruit marshmallows, for this recipe, I knew I had to stick with the classic mini marshmallows. Why? To let all that pineapple flavor shine through! That tropical treat really makes this version of fluff special, and pairing it with creamy, sweet marshmallows only brings out the tangy flavor. I’ve partnered with Emily from Jelly Toast and Campfire® Marshmallows to create recipes to share with you throughout the entire year. If you’re a marshmallow lover, you’ll definitely want to stay tuned for loads of ooey-gooey goodness! 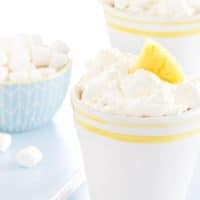 We even created a Marshmallow Madness Pinterest board where we’ve pinning loads of delicious marshmallow recipes that are perfect for any occasion. Like these S’mores Cookie Cups and No Bake S’mores Cheesecake. Puree cottage cheese in a food processor until smooth. Transfer the pureed cottage cheese to a large bowl and whisk in the dry Jell-o mix until thoroughly incorporated. Use a rubber spatula to fold in the whipped topping until no streaks remain. 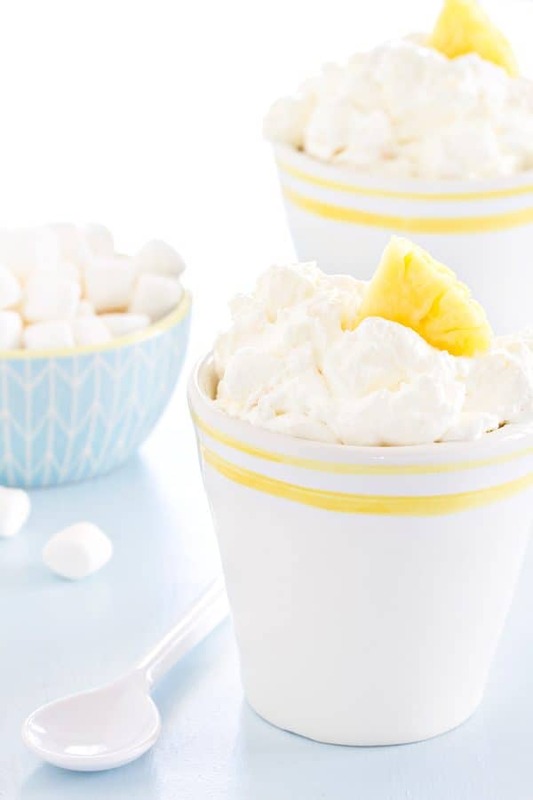 Fold in crushed pineapple and mini marshmallows. If desired, serve topped with a dollop of whipped cream or whipped topping and fresh pineapple slices. 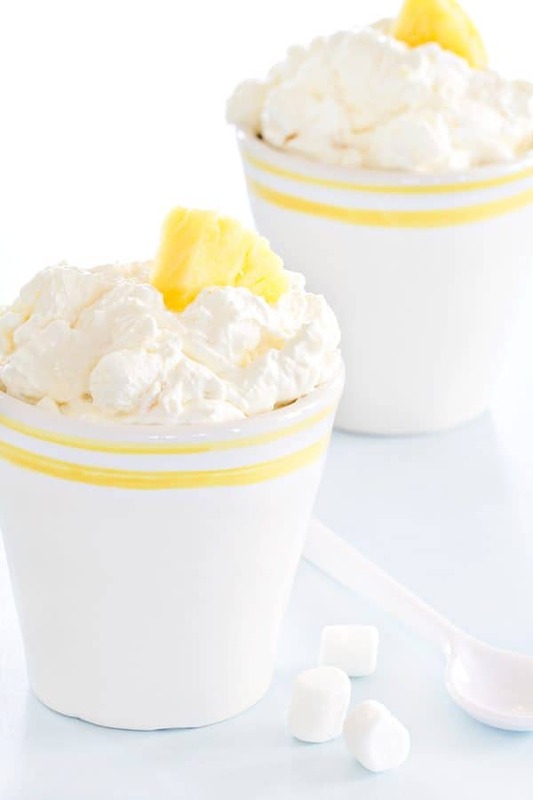 I can’t resist pineapple fluff when I see it…this looks heavenly! Thank you, Aggie! I think it’s hard to resist, too! Thank you, Trish! I’m with you…fluff is awesome! Hi! Love this recipe, I just have one question. I live in the Netherlands, and have never seen frozen whipped topping. Could I just use fresh whipped cream? Hi, Tamar! I think you could substitute sweetened whipped cream, but the texture will probably be different. I hope you like it! we make pumpkin fluff in the fall, I think we need to try pineapple fluff ASAP! Pumpkin Fluff…definitely! I hope you enjoy this, Cheryl! What a fun tropical twist. I want to swan dive into this delicious dessert! Growing up my mom always had cottage cheese on hand so I love in just about ANYTHING! (I’m serious! In lasagna it’s great, it’s fluff dessert it’s great and plain it’s great!) BUT I love marshmallow probably a little more than cottage cheese. I love campfire marshmallows because they are so squishy and soft – I know they worked great in this fluff! Oh Jamie! Another delicious fluff recipe! 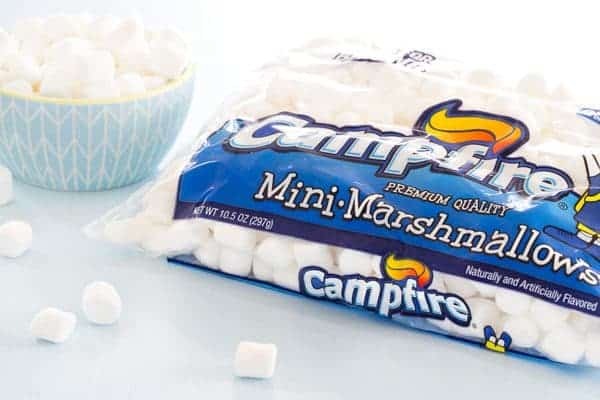 And campfire marshmallows are the best although I never see the mini ones in upstate NY….you might have to send me a case or two! I’ll be trying this one…. Campfire Marshmallows are the best! I hope you enjoy it! This is the type of dessert that’s so light and fluffy I fool myself into eating 5 helpings!! Needless to say I LOVE IT!! This looks amazing! I made myself pineapple overnight oatmeal, but now I wish I had saved the pineapple for this. Haha!! Pineapple oatmeal sounds amazing, Kloe! I have a great aunt that back in the day was KNOWN for her jello molds and fluff desserts and she always used cottage cheese too. I don’t get the cottage cheese hate out there! This fluff looks rockin’. Thank you, Gina! Cottage cheese lovers unite! How long does this stay good in the fridge ? Hi, Shan! I usually serve this the same day I make it, so I can’t honestly say. Maybe a day or two? I hope you enjoy it! Hello! I am typically able to find pineapple jello at my local Walmart, but you can also find it on Amazon if your local stores don’t have it. Hope this helps!